Japanese Episode AG 089: "Pikachuu, Roketto-Dan ni Hairu!?" American Episode 361: "A Scare to Remember"
While on the way to Minamo City, Satoshi's Pikachu is attacked by the Rocket-Dan. A battle to rescue Satoshi's pokemon begins, but it comes to a quick end when the Rocket-Dan's mecha explodes. Everyone is sent blasting off in different directions, with Satoshi, Haruka, Takeshi, and Masato ending up in one spot, Musashi and Kojirou in another, and Nyasu and Pikachu in a third. Much to Nyasu's surprise, it seems as though Pikachu is suffering from memory loss! The Rocket-Dan pokemon tells Pikachu that it's his ally and begins to befriend his long-time enemy. Nyasu reunites with Musashi and Kojirou and tells the duo about what happened to Pikachu, and so the two work to get the electric-type pokemon to trust them. Shortly after, Satoshi, who used his Ohsubame to find out where his pokemon was, arrives on the scene to take his pokemon back. However, Pikachu doesn't want to go with him! After a short battle in which the Rocket-Dan command Pikachu to attack its trainer, the Rocket quartet makes its escape in their Nyasu balloon. Satoshi jumps onto their basket and climbs to the top, so Kojirou commands Pikachu to use Thunderbolt. The attack causes the balloon to explode, sending Satoshi and Pikachu hurtling toward the ground! Luckily, they land in a river, where they drift a distance away. Haruka and the others catch up with Satoshi and are happy to learn that Pikachu seems to have gained its memory back! The Rocket-Dan drop in one more time, expecting Pikachu to help them out, but Satoshi surprises them by having his pokemon send them blasting off. With a renewed sense of friendship, Satoshi and his Pikachu, along with Haruka and the others, continue their way to Minamo City. This episode doesn't really stand out to me. The "main hero gets amnesia and teams up with the bad guys" plotline is about as clichéd as you can get, and the episode doesn't really do much with the story to make it any better than the dozens of Saturday morning cartoon shows that have done this before. The dub version of this episode teaches us that pretty much every flashback from here on out is going to get screwed over in the English version. Other than that, though, it was nice to hear so much of the music from "Camp Pikachu" make its way into the dub, since 4Kids seems to like replacing that kind of stuff for some reason. A second is cut from the opening shot of the episode. *Scenes of a sick Pikachu from the first AG episode. *The scene where Pikachu shocks Satoshi and then bites him, also from the first AG episode. *Scenes from Pikachu's battle against Tsutsuji's Nosepass. We see it get attacked by Rock Tomb. *Scenes from Satoshi's rematch against Senri. We see his Yarukimono grab Pikachu before getting knocked out by the mouse pokemon's Iron Tail. *Satoshi proudly holding up his Balance Badge. 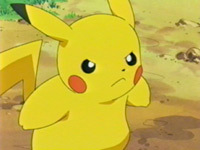 *Pikachu turning away and going to Team Rocket, from this episode. *Pikachu licking the bite wound it gave Ash from the first Advanced episode. *Ash trying to convince Pikachu that Team Rocket is the bad guy; Ash and Pikachu blasting off; Jessie, James, and Meowth running with Pikachu; Pikachu shocking Ash; and Ash falling with Pikachu (all from this episode). *A shot of Ash and Pikachu sleeping on the boat from "Hoenn Alone." *A shot of Pikachu and Ash with watermelons, from "What You Seed is What You Get." *Ash proudly holding up his Feather Badge. *Ash and Pikachu with their wings from "True Blue Swablu." *Pikachu waking Ash up, from the first Advanced episode (I think). Looking above, it looks like the English version should be longer, but in actuality, both the Japanese flashback and the English flashback last for the same amount of time (36 seconds). You're already gone, but I'm hanging on! I've posted some pictures from the Japanese version of the flashback on a separate page to help out some of you guys who are using dial-up. This edit is particularly annoying because it's just so...so...so POINTLESS. I mean, half the clips used in the dub flashback are clips that occurred five minutes earlier in the episode, for crying out loud! What was the point, 4Kids? Four seconds are cut from the shot right after the final commercial break.